cMT3090 with built-in CODESYS is a high-performance HMI in compliance with IEC 61131-3 Programmable Logic Controller (PLC) standard. Combining cMT3090+CODESYS with iR Series I/O Modules delivers a new generation solution that achieves a more compact and flexible architecture. 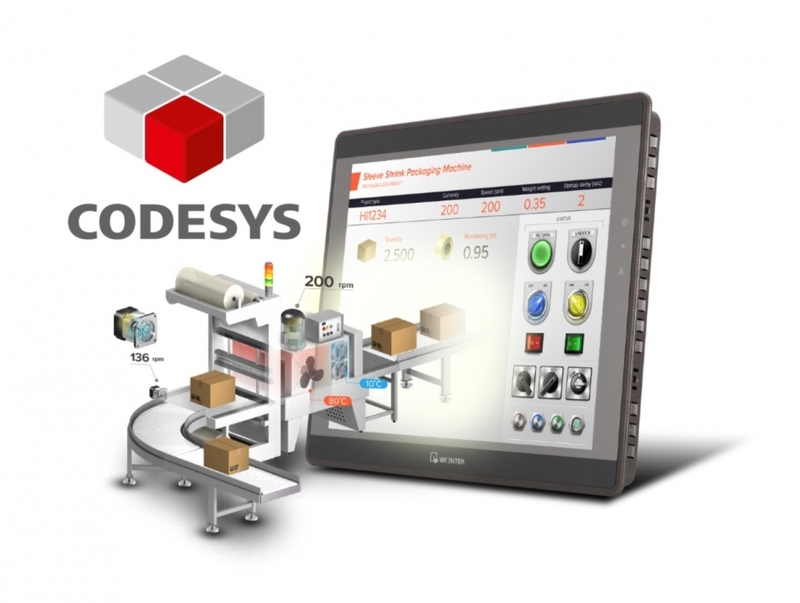 cMT3090+CODESYS is a product that integrates high-performance cMT Series HMI with CODESYS PLC controller system, which is built upon an innovative architecture where a duo-core CPU runs 2 independent operating systems. With the multi-core processor, cMT3090+CODESYS is able to not only provide data visualization with an operable user interface but also runs controller logic. The two systems run independently without mutual interference. On the one hand, the HMI boasts delicate graphical UI and advanced integration features (direct database access, OPC UA, and MQTT); on the other hand, CODESYS controller system in compliance with IEC61131-3 supports multiple languages such as FBD/LD/IL/ST/SFC/CFC, thus optimizing development flexibility. cMT3090+CODESYS utilizes a unique internal communication channel, to allow the display unit to obtain control information from CODESYS very quickly, while at the same time aiding CODESYS controller system in connecting with other systems like database and 3rd party controllers. In addition, cMT3090+CODESYS is equipped with dedicated Ethernet and CAN bus interfaces which allow for stable and highly efficient data transmission to satisfy miscellaneous automation demands. iR Series I/O module is a brand-new series Weintek product. By using couplers that support different bus systems: CANopen or MODBUS TCP/IP, this modularized system is compatible with most existing control systems. Patented fixture clip makes it easy to connect many I/O modules and effectively prevents modules from falling off due to shock. Flexible module assembly can avoid unnecessary nodes and reduce overall costs. Additionally, iR Series patented iBus technology is strong in noise resistance and efficient in communication that ensures correct and timely update of I/O status within milliseconds even if over 10 modules are used. Choose the exact number of I/O modules you need. You can reduce the size of your system and reduce the wiring complexity because of it’s small and delicate form factor. Lastly it has plug-in I/O installation with screw-less design decreases installation time and the possibility of loose wire from traditional screwing. cMT3090+CODESYS features reduced complexity with no extra PLC hardware needed. Its innovative design makes two operating systems run on one HMI independently. Built-in CODESYS operating system ensures that running controller logic will not be interrupted due to the complexity of the screen. CODESYS has full control of Ethernet (LAN1) and CAN bus. This ensures the real-time performance of control system. Its high performance boasts bit operations that take only 10 nanoseconds (10-9). A medium-to-high level control system performance. The cMT3090+CODESYS also has fast internal communication (cMT and CODESYS). Dedicated data channel between the two systems allows the display unit to obtain control information from control system very quickly and ensure efficient data exchange. CODESYS configuration and project management can be done from display side, including PLC status, network information, real-time data/tags. It also includes rich and vivid picture libraries, over 300 protocols, MQTT, OPC UA client/server, and EasyAccess 2.0 remote access service.